Posted on Sun, Aug 5, 2012 : 5:58 a.m. The view of Ann Arbor from inside a Zaragon West room. It took more than four years, dozens of city meetings and 900 building inspections, but downtown Ann Arbor’s Landmark high-rise is nearing its final hurdle before tenants can move in. The skyline-altering high-rise, located on the corner of South University and South Forest near the University of Michigan campus, has to clear its upcoming safety inspections before it can receive a temporary certificate of occupancy, said Ralph Welton, the city’s chief development official. Two other housing projects opening this month, Zaragon West and City Place, already have received a temporary certificate of occupancy and have the go-ahead to start moving in tenants. Welton said he’s had building inspectors on-site at Landmark for up to eight hours a day, helping to ensure the 600-bed development opens by Sept. 1. Together, the three developments represent a significant investment in the Ann Arbor area. According to preliminary plans submitted to the City of Ann Arbor in 2010, Zaragon West was estimated to cost $20 million to build. Documents obtained by AnnArbor.com on City Place said it was a $13.5 million project. At Landmark, formerly called 601 Forest, the land deal alone was reportedly worth at least $12 million. The projects also bring about 1,000 beds to downtown at a time when the housing market near the University of Michigan continues to attract national investors. Landmark, Zaragon West and City Place join two other recent high-end student developments: Sterling 411 Lofts, located on East Washington Street, and Zaragon Place, located on East University Avenue. Ann Arbor's City Place apartments on Fifth Avenue, pictured in May. With a price-per-bed that ranges from $800 all the way up to $1,745, and lavish amenities such as yoga studios, movie theaters and tanning beds, these developments are a far cry from some of the more traditional student properties near downtown. Amy Khan, president of local property management company CMB, said she was worried the opening of the new developments would result in vacancies at CMB's properties around Ann Arbor. "We expected that it would be a lot harder to find residents because there would be so much competition," she said. "At the Corner House Lofts (on State Street), we did find that the biggest effect it had on us was that we have more residents doubling up on rooms." She continued: "Many of our floor plans allow up to two residents to share a bedroom...those students more on a budget can still live on central campus in a high-rise building, but they can share a room because it's substantially less to do that." She said CMB's properties are still fully leased for the 2012/2013 academic year. "The cost to live in those new high-rises is so high that it actually kind of helped us, I think," Khan said. "None of our apartments are that expensive. "You look at some of those prices and you wonder how they find people to afford it; but they do." Khan's right: So far, it appears the amenities and convenient locations at the new developments seems to be outweighing the high rents. In October, JJ Smith, executive vice president of development and construction for Landmark property owner Campus Acquisitions, said availability was already limited for popular floor plans at Landmark — and that was when the building was only three floors off the ground. Rick Perlman of Chicago-based Zaragon Inc. said his local developments, Zaragon West and Zaragon Place, are both at nearly 100 percent occupancy. Perlman said construction has wrapped up at the 14-story, 200-bed Zaragon West, located at 401 Thompson St., and tenants are starting to move in on Monday morning. On Fifth Avenue just south of downtown, tenants were unloading cars and moving in to the 144-bed City Place development last week. Developer Jeff Helminski of Rochester-based Campus Village Communities told AnnArbor.com he’s “thrilled” with the development, both aesthetically and from a leasing standpoint. He said the tenants are primarily business school and law school students. Welton, the city’s chief development official, said he doesn’t anticipate any snags with the opening of the three developments, but once the city completes the final safety inspection at Landmark, he said his inspectors won’t get much of a break. “You know, it’s nice to get these three (housing projects) out of the loop, but we have a couple more going in pretty quickly,” he said. 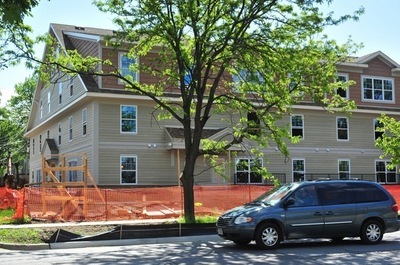 Construction is under way at the 155-unit Ann Arbor City Apartments at the corner of First and Washington. Developed by Farmington Hills-based Village Green, the project is targeting young professionals. The 13-story The Varsity project, located on East Washington Street next to Sterling 411 Lofts, is under construction and will bring 415 beds to downtown. City Council recently approved plans for 618 South Main, a project that promises to bring 231 more bedrooms to South Main Street. Local developer Ed Shaffran last week proposed adding two floors for high-end apartments and condominiums to the top of his historic downtown building. Mon, Aug 6, 2012 : 5:08 a.m.
Man, those City Place Apts are ugly. Mon, Aug 6, 2012 : 4:04 a.m. I find it interesting that Zargon West was built new for about $100K per bed while UofM will spend about $100K per bed to renovate Alice Lloyd Hall! I lived in Alice Lloyd hall as a Freshman, nothing special! I am truly appalled that a non-profit state institution is so profligate with the public's money. Compare amenities at Zargon West with Alice Lloyd and tell me with a straight face the public is not getting ripped off with money spent to maintain Alice Lloyd. I wonder how many meal tickets are getting punched with the Alice Lloyd rehab while the public gets stuck with the tab? The fact that the UofM is closing Baits II while closing other dorms for rehabs is an indication of how unconcerned UofM is with the needs of students and families that are already over taxed as it is. Tue, Aug 7, 2012 : 1:27 a.m.
Not sure that public money is involved in UM housing anymore than it is in these other commercial high rises. Mon, Aug 6, 2012 : 10:37 p.m. Does the fee for Alice Lloyd include meals and does the cost of Zaragon West do the same or not? Mon, Aug 6, 2012 : 3:15 a.m.
Lizzy Alfs -- I think it would be useful to put the number of new apartments/beds in context with a baseline number of existing rental units/beds of both University and private ownership. A number like 1000 new units sounds large in the abstract, but what is it as a percentage of all existing rental units? One commenter speculated that closing Baits II and East Quad for renovation could strongly impact the market. I doubt that (just not enough beds there in my opinion), but facts would be helpful in making sense of the market. Mon, Aug 6, 2012 : 2:19 a.m.
Demand for housing is artificially inflated by the University closing Baits II while renovating East Quad. The constraint of supply makes high prices stick, and occupancies are low while there is the appearance of additional private sector capacity foisted on the populace of Ann Arbor. Sun, Aug 5, 2012 : 9:32 p.m. I do hope that some of the low-life slum lords around town will go out of business with all these new shiny student complexes opening. There are still some dreadful landlords around the city ripping off students, and I hope they go down in the near future. Kudos to the new developments! Long overdue! Until accurate occupancy rates are known later in the year, remain skeptical that Landmark, Zaragon West and City Place will actually lease all their apartments, especially at an average annual leasing rate of $12,000. The descriptions of the accommodations do not seem so luxurious with smaller bedrooms and shared common space. In addition to the 1000 new apartments the three new buildings are introducing into the Ann Arbor rental market, another 1025 apartments will join them when the Georgetown Mall, Ann Arbor City Apartments, Varsity and 618 South Main residential buildings are completed. Therefore, over 2000 new apartments will enter the Ann Arbor rental market in the near future. Meanwhile, the University of Michigan has announced some time ago its intention to reduce the number of admissions. 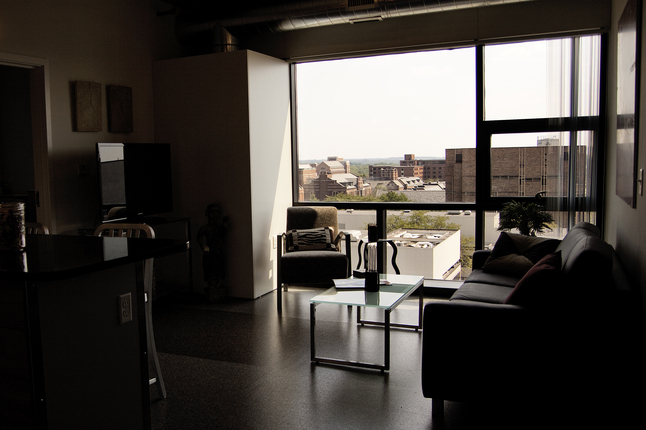 In sum, the Ann Arbor student luxury rental market should soon be saturated. The leasing rates offer little chance for reductions in view of the high cost of construction and its financing, the cost of operation and maintenance, and taxes. The owners want a profit also. With little chance for downward movement of leasing rates some of the new student residential construction may become bankrupt, reminiscent of Ashley Terrace. Sun, Aug 5, 2012 : 6:17 p.m.
Do the parents willing (and able) to pay for such &quot;digs&quot; realize that the Ann Arbor Fire Department doesn't have in use a ladder that even goes as high as the 5th floor? Might a little part of the high rent be due to investors' need to pay higher fire insurance costs? Of course, that's not public information, but the equipment of the AAFD is public information. I don't think Ann Arbor has equipment comparable to the fire department ladder used (mostly not vertical in that instance) by the city of Aurora, Colorado? That information might make parents prefer paying for rooms and apartments closer to the ground in older, subdivided houses. Sun, Aug 5, 2012 : 7:45 p.m. The old McCormick Place in Chicago burned to the ground despite being entirely constructed of non-combustible materials. Of course fires can involve furnishings installed after construction and brought in by residents. Fires do not have to be big to kill as smoke itself kills. Tall buildings in Chicago, for instance, such as the John Hancock Building, have several fire hydrants and hoses essentially built into each floor since fire fighters can not carry heavy fire hoses up as many as 100 stories to battle a fire on a top floor. Does Ann Arbor city code require similar fire protection be installed in all buildings taller than three stories which can not be reached by ladder trucks otherwise? Sun, Aug 5, 2012 : 6:31 p.m. I'd bet that the design professionals and developers got &quot;trade offs&quot; to the building codes for the increased height by using non combustible construction and increased fire safety and suppression systems. No matter their height, newer buildings built to current codes, often of non combustible construction (concrete) are far safer than old buildings built under old or non existent codes and combustible construction. Sun, Aug 5, 2012 : 4:53 p.m. Families with children don't want to live on top of campus. These high rises are a sign of the free market success of UM and downtown Ann arbor, in providing jobs for those who construct, maintain and service the population that can afford to live in such high rises. Adopt an attitude that runs off the big developers and the affluent population that rent their units and you are asking for the ypsilantiization of Ann arbor. Where are the 20 mil high rises in Ypsilanti, or the MBA and law students that will pay 800 per bedroom ? No, instead you have the 3 bedroom for 800 that is subsidized by the federal tax payer. Sun, Aug 5, 2012 : 1:53 p.m. I think my last comment crashed the internet so this try will be less intense. Sooo glad visionary Mayor Hieftje &amp; Company are going to crack down on overpopulation per unit and start taxing landlords by unit property address instead of just property address. Sun, Aug 5, 2012 : 1:30 p.m. I love it! Build baby Build!! Sun, Aug 5, 2012 : 6:25 p.m.
What's the cost of improved public infrastructure? Like larger water and sewer lines, fire safety, electrical, roads, parking, etc? There is a public cost to increased population density and larger buildings. Sun, Aug 5, 2012 : 12:46 p.m. I too would like to see more single family residences added to the mix in the near downtown. Unfortunately, conversion of houses that have been savaged for multiple occupancy is often prohibitively expensive, or so I am told. Some of these projects are not bad, but others, such as the horrid &quot;City Place&quot; that the developer is so &quot;thrilled about&quot; will only serve to keep families away and perhaps even lead to some who have been living in the area to move away. Too many members of Council have been interested in such development at the cost of those who have made a point of maintaining old buildings for single families. One cannot do anything about the ravaging of the area, but those who have the opportunity can do their best to vote some of them out on Tuesday. Mon, Aug 6, 2012 : 11:39 a.m. I'd like to see not just more single-family residences but also 1- or 2-bedroom units for single or childless non-students who would like to own right now but are also priced out. You can't even find a studio condo for under $100,000 in any of the walkable parts of the city. Sun, Aug 5, 2012 : 12:27 p.m. I like reading news articles like this.. It's refreshing. Sun, Aug 5, 2012 : 12:09 p.m.
Glad to hear that emergence of new units has actually helped existing companies like CMB. CMB is an excellent, local multi-property owner that has won numerous awards from tenants. They have been in a2 for decades, caring for their tenants and their properties. As stated, they offer units that are relatively affordable in context of the new low- and mid-rise units. There are many other professional owner and management companies in town. They have reported similar experience to CMB, with all units rented for fall. The most vulnerable owner in light of the new properties is the non-pro rental dabbler, whose main tenant-care program consists of walking to the mailbox to pickup a rent check. These folk should be most nervous. In a year, when more units have come to market, they may see some rental resistance from tenants. In this case, one vacant house/unit could wipe out total profit for the year. Sun, Aug 5, 2012 : 11:23 a.m. There are plenty of places for the offspring of the 1% to live in Ann Arbor. These luxury dwellings are visual reminders of the widening income gap in the U.S.
Mon, Aug 6, 2012 : 8:22 p.m.
&quot;Large highrises are often owned by large corporations who 'make' money by writing off vacancy losses from their other investment profit subject to taxes.&quot; What? That doesn't even make sense. Sure doesn't take much to get a thumbs up around here. Sun, Aug 5, 2012 : 5:02 p.m.
Sun, Aug 5, 2012 : 4:28 p.m.
More housing available = lower rents for everyone (even if it is for the 1%). Sun, Aug 5, 2012 : 11:20 a.m.
Man, that is a loooottt of highrises and apartments. It's unfortunate that it doesn't seem to be squeezing the management companies and/or landlords; I had hoped that these apartments would cause some of these scummy landlords to sell, and we could maybe get families that cared about their homes into some of these houses that are just going to pot. I think the biggest help to Ann Arbor would be to get some families into these houses, especially during this housing slump which makes them just very expensive, instead of stupidly ridiculously expensive. Sun, Aug 5, 2012 : 8:24 p.m. This is happening some, particularly in the Kerrytown area where the breadth of walkable grocery shopping makes it truly unique among city neighborhoods.